Moles aren't cancer, but they're not completely normal either. 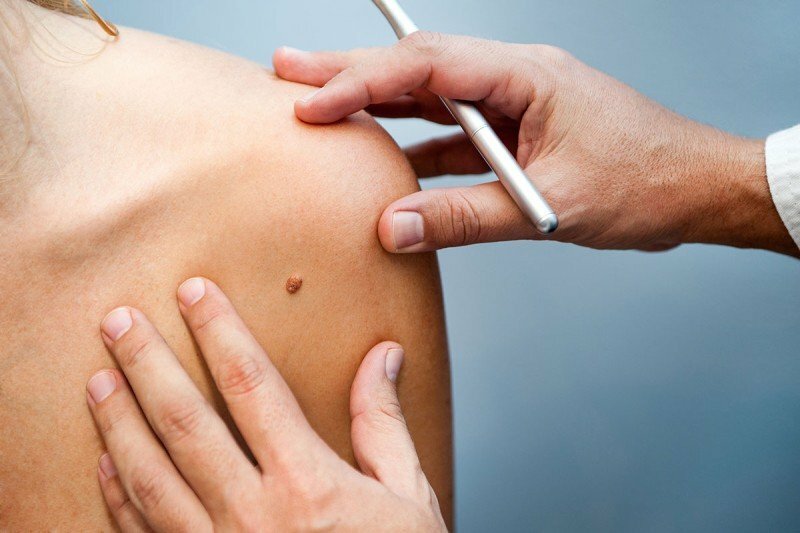 Why some moles turn cancerous while the vast majority do not isn't fully understood. Scientists are learning that inflammation can play a role in cancer development. This is one example of how the environment surrounding an abnormal cell can influence its fate. Growing up, Philipp Niethammer learned from his mother to never scratch his moles. That old warning resurfaced in Dr. Niethammer’s mind not too long ago when he read a research article describing how repeated injury to the tail fin of a zebrafish could cause tumors to develop. Like humans, zebrafish are prone to getting melanoma, a type of skin cancer. The study found that injuring the fish’s tail fin every couple of weeks for several months greatly increased the rate of cancer formation in that spot. More and more, scientists are coming to understand that wounds and cancer have a lot in common. “I figured other people had been warned by their parents like I was, and might be interested in the findings,” he says. Scratching moles isn’t a generally recognized way that skin cancer develops. And indeed, Dr. Niethammer stresses that the fish study should not cause people to worry unnecessarily. But there likely is a grain of truth in the old advice, he says. Scratching can cause microscopic injuries, or even outright wounds. And more and more, scientists are coming to understand that wounds and cancer have a lot in common. The inflammation that results from an injury — and even the healing process itself — can actually promote cancer. Technically speaking, a mole is collection of cells called melanocytes. These are the cells in skin that make melanin, the pigment that creates a suntan, determines skin tone, and gives moles their color. Moles aren’t cancer, but they’re not completely normal either. Pretty much all of the melanocytes in a mole have a mutation in a cancer-related gene called BRAF that causes them to grow and multiply. But the vast majority do not turn into cancer; they simply go to sleep, a state called quiescence. What makes a small fraction of moles become cancerous is not known, but it is an active area of research. One hypothesis is that it’s not so much the genetic mutations a mole has but what the surrounding tissue looks like — for example, whether it is irritated or inflamed. There is an increasing amount of evidence that inflammation can convert a group of abnormal cells into a full-blown tumor. Like Dr. Niethammer, Dr. White studies these and related issues in zebrafish. These small freshwater fish have some useful features when it comes to studying cancer. For one, they’re see-through, so researchers can watch what’s happening under the skin without cutting them open. For another, their immune system is a lot like that of humans, so lessons learned in one may apply to the other. A study that Dr. White and colleagues published last year lends support to the idea that the area surrounding a cancer cell can influence its fate. Whether short-term inflammation can promote cancer as well is still an open question. But given the similarities between a healing wound and a growing cancer, it’s not so far-fetched. In the study that prompted Dr. Niethammer’s commentary, the researchers repeatedly cut the same part of the fish’s tail for months. But there are other cases suggesting that even short-term inflammation can be the spark that ignites a flame. Some older research studies point in this direction. And in May 2018, a scientific paper published in the journal Science Translational Medicine reignited the debate. That study, led by Robert Weinberg at the Massachusetts Institute of Technology, found that a surgical wound could cause dormant breast cancer cells in mice to wake up and start to grow and spread. Dr. Niethammer doesn’t know of any documented cases in which a person scratching a mole led to cancer. It’s more a theoretical possibility than a proven scenario. May I ask you why is there a higher rates of skin melanoma which is potentially fatal for people exposed at the 9-11 sites. I would like to share this information to my group (RN Case managers). Thank you.